The loggerhead sea turtle is a very large sea turtle that spend most of its life far close to shore. It is has a brown (reddish brown) top shell. Some specimens are lighter than others and some turtle might appear almost yellow. The species spend more than 85% if theif life under the surface. They can dive and search for food for 15 to 30 minutes at a time before having to surface to breath., They can rest under water for up to 4 hours. When they rest they lower their hearth beat to conserve oxygen. They prefer to rest on a flat surface on the bottom of the sea. The Loggerhead turtle can be found across a large distrubution area but the largest population is found of the Florida coast in the US. They spawn all along the FLorida coastline and they compete fiercely over the best nesting spots. Females are known to destroy old nest to lay their eggs in the best spots. Adults loggerhead sea turtles have very few predators. They are too large and their shell too hard for them to fall prey to most predators. They shell are thickest in the back. This is likely to protect them against sharks while foraging for crustaceans at the bottom of the sea.. They are named due to their very large head. The loggerhead sea turtle can grow very large. There are confirmed records of specimens reach 280 cm in length, About 9 ft. The heaviest loggerhead sea turtle known weighed 454 kilograms. More than 1000 lb. Most loggerhead sea turtle are a lot smaller then that and about 90cm / 3 ft is a normal size for an adult turtle. Loggerhead sea turtlehave very strong jaws. This allows the to eat crustaceans and other animals with hard thick shells. 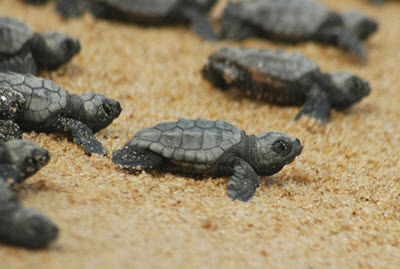 Young loggerhead sea turtle spend most of their time far out in the ocean and are know to travel 1000s of kilometers. Adult turtles are mainly found in shallow waters closer to shore where they are able to find a lot of prey. The species are slow and unable to catch fast moving species. They eat a few fish but mostly feed on jellyfish, crustaceans such as crabs, and conch shells. Loggerhead sea turtle move around a lot and they cover large distances in their search for crustaceans and other food. The bulk of their diet consist of meat but they also eat a lot of sargassum sea weed and are consider as omnivorous. Sadly, the fact is that they face many dangers as they travel the seas including accidental capture and entanglement in fishing gear, the loss of nesting and feeding sites to coastal development, poaching, and ocean pollution including plastic. Many wildlife organizations try to raise awareness about the likely hood of possible instinct of the turtles, due to low numbers of Loggerheads in the ocean today.